New York Rangers President and General Manager Glen Sather announced today that Mike Barnett has been added to the hockey club’s personnel as Senior Advisor to the President and General Manager and Director of U.S. Amateur Scouting. In his role, Barnett will work closely with Sather, and Assistant General Managers Jim Schoenfeld and Cameron Hope, on player transactions and player personnel, as well as oversee the team’s amateur scouting operations in the United States. Mike Barnett's long association with the NHL includes the perspective of both a team's general manager and an agent for superstars, including Wayne Gretzky. Barnett joins the team after working with the Phoenix Coyotes organization as General Manager, Senior Executive Vice President and Alternate Governor for six seasons. During his tenure with the Coyotes, he was responsible for overseeing all aspects of the club’s hockey operations, including all matters relating to player personnel, coaching staff and scouting department. He made an immediate impact in Phoenix, leading the team to their best record in Coyotes history (40-27-9-6) and finishing one point shy of the highest point total in franchise history (95 points) during his first season as GM in 2001-02. In recent years, after rebuilding the scouting staff, he added a strong stable of youngsters with Peter Mueller, Martin Hanzal, Keith Yandle, Keith Ballard, Zbynek Michalek, Daniel Carcillo, Daniel Winnik, Blake Wheeler, and Kevin Porter among others. In addition, Barnett signed Phoenix franchise cornerstones Shane Doan and Ed Jovanovski to long-term deals. Prior to the 2006-07 trade deadline, he completed a series of transactions to secure Phoenix with seven draft picks in the first three rounds of the 2008 NHL Entry Draft, and amassed 25 total picks for the Coyotes in the last three seasons. 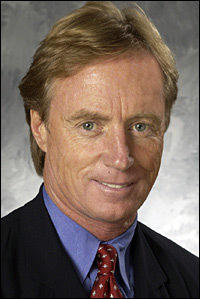 Prior to his stay in Phoenix, Barnett served as President of International Management Group’s (IMG) hockey division for 12 years. As a player agent, Barnett earned a reputation as one of the most creative and well-informed agents in the industry. His client list included several high-profile players such as Wayne Gretzky, Brett Hull, Paul Coffey, Jaromir Jagr, Joe Thornton, Mats Sundin, and Sergei Fedorov. A former player, Barnett played two seasons of professional hockey with the Chicago Cougers and Houston Aeros organizations of the World Hockey Association (WHA) from 1973-74 to 1974-75, following his junior hockey and collegiate careers. He suffered a career-ending eye injury while with Houston. A St. Lawrence University and University of Calgary graduate, Mike has two sons, Jesse and J.T., and three daughters, Joey, Janie and Jenna.